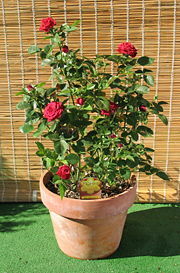 If you love gardening roses, then you will also love landscaping your yard using the beauty of roses. Landscaping includes designing a space for plants, flowers, and trees in your yard, someone else’s yard, or even in front of a business. When you landscape using roses, you will find that the beautiful roses will add a beauty and appeal like nothing else and it will also give you a great sense of pride in a job well done. Merging roses in with your trees, bushes, and flowers, will make the area look more interesting both texturally and visually. When landscaping, you have a particular space to fill that is a specific dimension, much like you do when you have a regular rose garden. When landscaping, you include the rose garden in a space with trees, bushes, and other flowers that will create a beautiful cohesive garden with. To begin your landscaping, you will want to use a pencil and paper to design the area by sketching where you want to place the roses, trees, bushes, and other flowers. If you do not create a plan, then it will be difficult to plan what plants that you will need and how they will all work together. Now that you have some idea of where you are going to place your rose bushes, you need to determine what colors will work best with the home or building that the garden will be near and the other plants that are in the garden. For example, orange hibiscus plants are beautiful, but pink roses right next to them may not look that great. Blues and purples coordinate beautifully though, to help keep your landscape well balanced and beautiful. Rose bushes need space to grow properly so you may need to clear out the area around your roses to allow them room to grow. Too many plants and flowers in an area can look cluttered, so it may be best to choose a few beautiful plants that you can concentrate on, rather than a plethora of plants that is hard to look at because it looks so cluttered. Make your choices wisely to help enhance your landscaped garden, rather than detract from it. 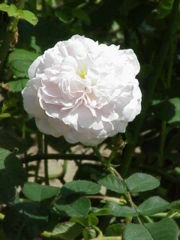 Roses can add both visual interest and a beautiful smell to your garden. Adding them to a landscaped garden can give your garden an entirely new look and feel that you will enjoy and love for a long time to come.